The 18 oil paintings in this exhibition are collectively titled with a quotation from Martin’s late husband Ewen McCuaig: The roses are just moving into Fabulosity. 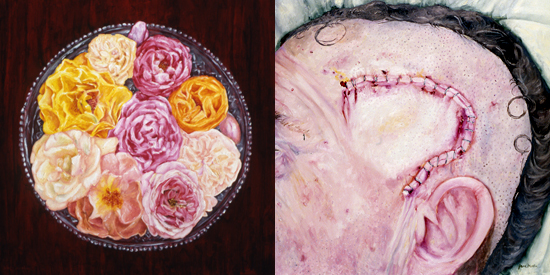 Half the paintings in Fabulosity are of roses grown in the garden at 21 Rose Avenue: Half are portraits of Ewen. While painted in 2009 they are of a time when he, like the roses, was just moving into fabulosity. Jane Martin is a senior Canadian artist. Fabulosity is Martin’s second solo second exhibition at Red Head. Her first, Something Happened in June 2008, was of drawings. The Art Gallery of Ontario has acquired several of the Something Happened drawings. Four of these were included in the exhibition The Matter of Loss in the summer of 2009 with works by Christian Boltanski, Greg Curnoe, Dena De Cola and Karin E. Wandner, Eric Fischl, Martha Issumatarjuak, Brian Kipping, Jane Martin and Spring Hurlbut. Last February Martin, with the other members of the Red Collective, participated in Deviant Detours at Kunsthaus Santa Fe, San Miguel de Allende, Mexico. Subsequently an installation work by Martin entitled Driving Ourselves to Death joined those by 19 other artists in an Temperatura al Tope, Centro Cultural Ignacio Ramírez El Nigromante, San Miguel de Allende, Mexico and in Mexico City. During Art Toronto she and other members of the Red Head Collective created Cases, a multi media installation, for upArt at the Gladstone Hotel. In addition Martin participated in two group shows at Red Head, Insomnia in October, and The Red Dot Show 2009 in December.